The AIA Small Project Awards are a program of the AIA’s Small Project Practitioners Knowledge Community, whose mission is to generate, collect, and distribute information for architects of small firms and designers of small projects. The AIA has more than 20 such communities serving different interest areas. All are open to design and construction professionals and to the public. 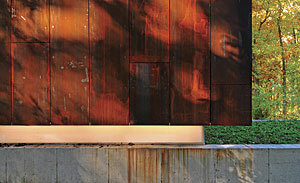 More than 200 projects were submitted to the 2013 program, 10 of which earned awards. 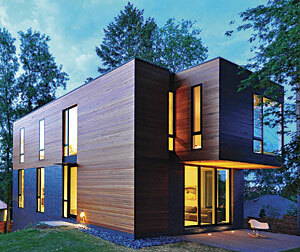 Featured in this Houses issue are four of these projects with a residential focus. 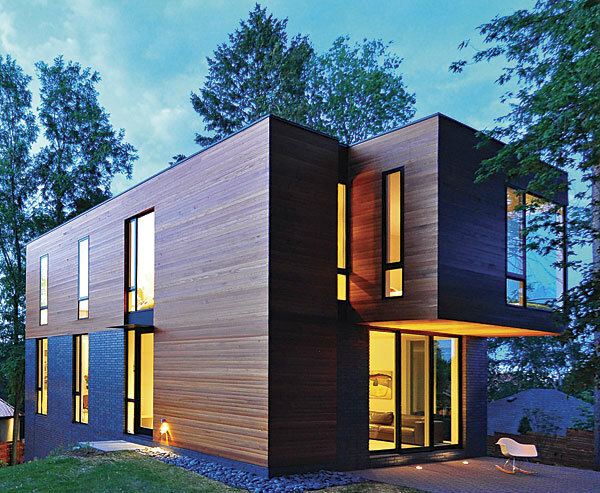 This year’s awards jury was composed of four architects who are small-project practitioners— jury chair Leonard Kady, AIA; Julie Beckman; Christopher Herr, AIA; and Laura Kraft, AIA—and Fine Homebuilding design editor Rob Yagid. Jury members volunteered countless hours reviewing the projects before making the final selections. The submitting firm’s identity was hidden, and jurors recused themselves if they recognized a project. 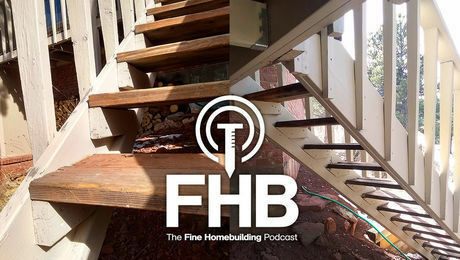 After two rounds of reviewing and rating projects individually, the jury came together for an all-day conference call to finalize the selections. If you would like to submit a project for next year’s AIA Small Project Awards program, visit AIA.org/spp in September for details. 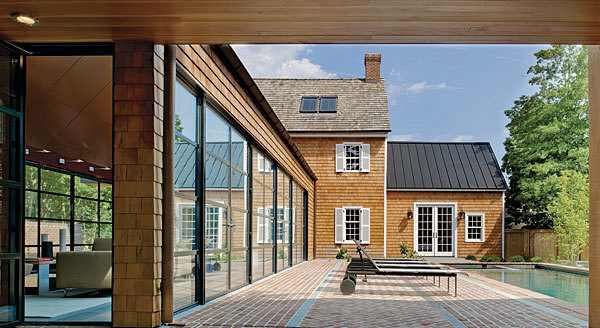 This project began with a small house originally built in the early 19th century in the heart of the historic district of Lewes, Del. 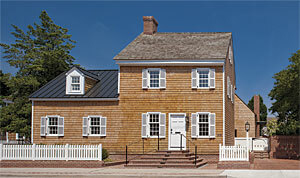 In the redesign, the exterior of the original structure was meticulously restored. A shed-roofed screened porch, storage room, and poorly proportioned living space added to the back of the house in the early 20th century were removed. 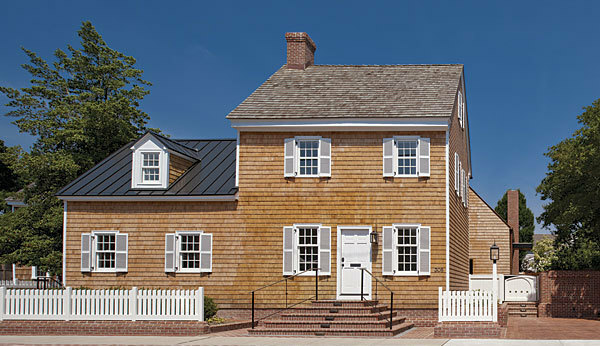 While the exterior of the original house was restored with historically correct detailing, the four new pavilions were crisply detailed, without overhangs and trim. The additions were conceived as one-story pavilions organized around a new swimming pool and a large deodar-cedar tree at the rear of the property. 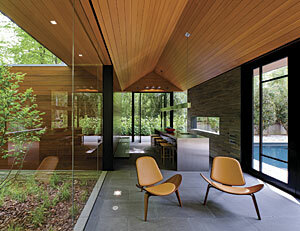 Large expanses of glass set in black-steel frames punctuate the cedar walls. Tall red-brick chimneys and landscape walls add vertical and horizontal elements, completing the composition. The original house now contains the main entry and four bedrooms. The interiors are decidedly modern, with white walls that transition cleanly to white-ash flooring. An open, floating staircase and glass walls, aluminum, and stainless steel contribute to the modern palette of elements and materials. 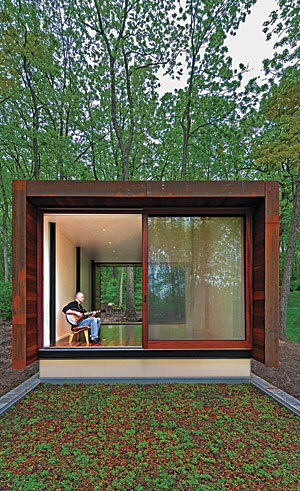 This compact home for a young family occupies a small site in a historic residential district in downtown Madison, Wis. 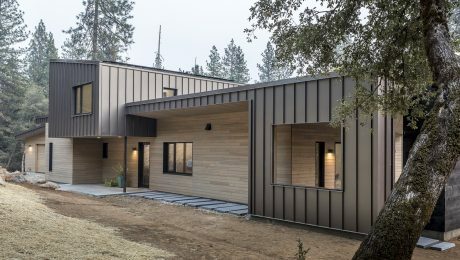 Successfully contesting the local preservation ordinance and its interpretation of stylistic compatibility, the house is an unapologetically contemporary building. It was placed in the back of its trapezoidal site to minimize direct visual competition with its historic neighbors. 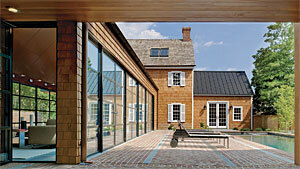 Steps lead up a slope to the front door, a glazed recess with a delicate steel canopy. 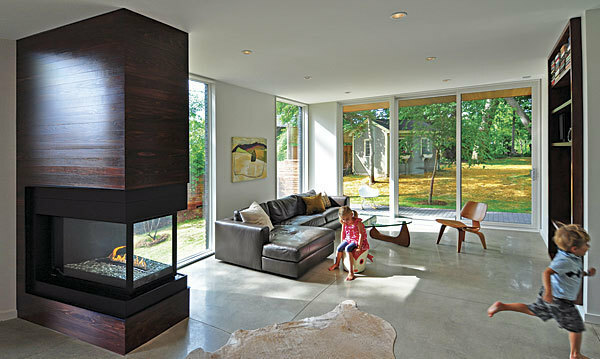 The door opens into a vestibule that leads into the main living hall, an open space whose neutral material palette is complemented by a trio of darkstained wood objects that spatially anchor the open space: an entertainment center; a fireplace and chimney; and a wood canopy cradling an intimate side lounge, which can be closed off to become a guest bedroom or a quiet study. An unassuming structure nestled into a rural Wisconsin hillside, this intimate retreat serves as a studio for a country-and-western musician to write songs and to reconnect with nature. With its exacting construction details and carefully restrained material palette, the building continues the tradition of Midwestern pastoral architecture. Carved into the sloped site, a concrete plinth provides storage space and supports a linear studio whose long sides are covered with a weathering steel shroud. Glazed openings a each end of the studio frame views of the landscape and provide access into the space and onto the green roof of the concrete plinth. The steel shroud is slightly lifted off the plinth, teasingly exposing a narrow clerestory that allows the studio seemingly to float above its base. The clerestory provides natural light for the storage space below; at night, it emits its soft glow into the dark countryside. Surrounded by mature trees and manicured gardens, this contemporary house anchors the site, located in a neighborhood bordering Washington, D.C. A new swimming pool, stone walls, and terraces behind the house organize the rear yard and create a connection between the existing house and the new pavilion. 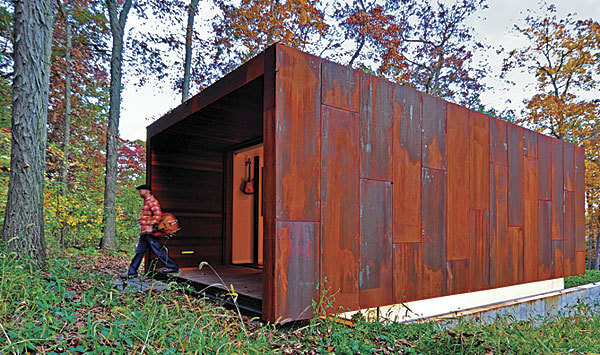 The pavilion, intended for year-round use, provides a threshold between the structured landscape and the adjacent woodland. A low-pitched, terne-coated stainless-steel roof floats above dry-stacked slate and mahogany-clad walls. The interior contains a stainless-steel kitchen along with a small living space, anchored by the fireplace. 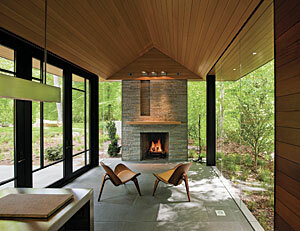 The bluestone flooring, stone and mahogany walls, and Douglas-fir ceiling create a warm, natural space. Five steel-framed glass doors along with frameless-glass walls and miteredglass corners enclose the space and provide shelter from the elements while allowing those inside to enjoy the beautifully structured garden and the natural native surroundings. The doors pivot to open the space during warmer months, while a large Rumford fireplace and heated floors provide a cozy interior in the winter.